Click on any picture for a large image. Click here to return to the Event Index. 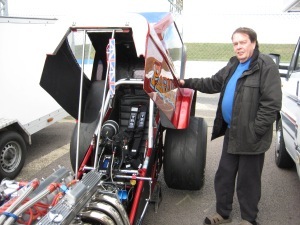 Outlaw Anglia racer Phil Drewitt was 1990 Super Gas champion. After a long layoff including some F2 Stock Car racing, he returned at this event with a 540cu in street legal Pop in which he ran a 9.84 and 9.58 on Saturday with high 130mph terminal speeds to qualify 11th in the 24 car field. 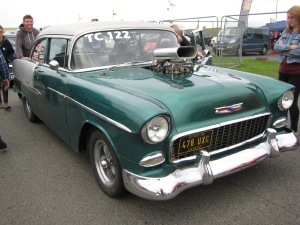 Outlaw Anglia racer Michael Hamilton has this car, last seen at the Hot Rod drags in 2017, and a nitrous assisted road-going Singer Vogue which graced the pages of Custom Car magazine back in 2013. Wild Bunch racer Peter Huckle has a Jaguar straight six out of a XJS, complete with supercharger, which has propelled the slingshot to a best of 10.46/121. He said 'The engine is from a breakers' yard and is a cheap way of getting horsepower and torque'. 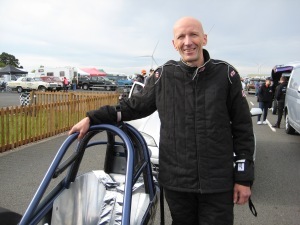 Wild Bunch racer Mark Coulsell was delighted to run new PBs of 8.22 and 8.23 at 157mph in the 'Ballbreaker' slingshot with its injected 383cu in SBC engine. 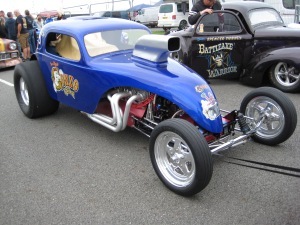 Wild Bunch racer Phil Sweeney has his 'California Dreamin' slingshot up for sale. The car has run a best of 9.00/148 and has an injected SBC for power. His first run was a high gear 9.6, but yesterday had plug oiling and oil leaks around the inlet manifold. Wild Bunch racer Mick Gleadow suffered fuel starvation issues on his run yesterday and the team richened it up for this morning's session. The team are hoping for an eight second time slip, the car having run a best of 9.084/142 last year. The car was built in 2016 by Comanche Race Cars. 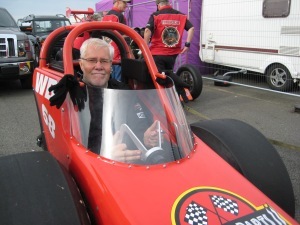 in 2017 Mick celebrated 50 years since he started competing at Santa Pod Raceway. Wild Bunch racer Bob Hawkins was pleased to have run a 6.62/120 yesterday, a 100th off his PB ET and 1mph off his best speed. He said 'The best thing was that the run was without damage. We are getting used to the tuning needs for nitro - a lot more lead in the timing, very rich mixture and more fuel at every part of the run'. The nitro percentage is now 54%. 'The higher the percentage the more it wants to go quick'. 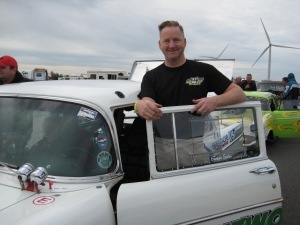 Wild Bunch racer Rob White started racing a year ago at the Hot Rod Drags at SCR. He said 'We are still finding our feet. I picked the car up turnkey in May 2017, it was the old Jurassic Parts car from Mick Gleadow. The colour scheme was inspired by my pink seat belt and I thought a flower power paint scheme would be reminiscent of the 1960s, where these types of car originate from. The current SBC engine is the second one used by the team after the original engine had a big blow-up, a rod and piston ending up in the inlet manifold. Only the valve springs were salvageable'. The car has run a best of 11.7 at SCR and Rob hopes to get back in the elevens here after installing a new carb. The future will bring a higher spec cam and modified heads. 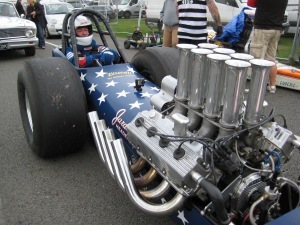 Wild Bunch racer Jim Tanner mounted a 8-71 blower on his SBC at the start of the year, and the times went down to 9.4s. He said 'I already had the blower and then last winter got a second hand block for only £200 - it is a two bolt mains block so I am hoping it holds out. The additional capacity of 400cu in is giving out more power and the blower is underdriven at the moment, so it is more of an ornament. Over time I will get it to give more boost and hope the bottom end holds out'. 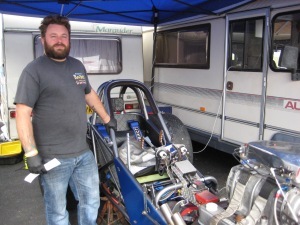 Wild Bunch racer Paul Bambrick has had his 225 inch chassied slingshot for eight years. 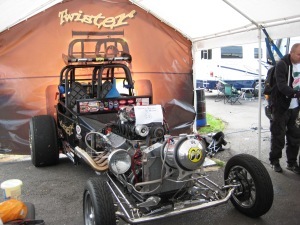 He said 'I built the chassis with a friend and then got the engine from Ray Barton in Pennsylvania in kit form. It is 528cu in and based on the late model 426cu in Hemi with rocker covers that look like those on the early model.' Paul did the sign writing on the car also to make it look late 60s period correct. The car ran a 8.78 best at 147mph and the team are looking for low eights on methanol, with the new fuel pump fitted for this race. Future plans for Paul and crew Mark England include a 60% dose of nitro. 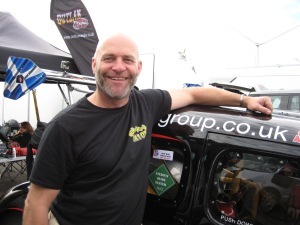 Wild Bunch racer Steven East is in his third year with Ellie's in Trouble Now, named after his daughter. He said 'The car used to be owned by Steve Field and called Black Pig One. 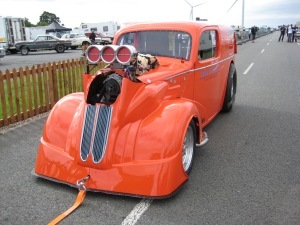 As part of the Wild Bunch we are delighted that Santa Pod Raceway is supporting the class here as SCR was our main track for the two NSRA events. I am crewed by my son and daughter and there is a great family atmosphere after the racing'. The car has a SBC and run a best of 9.42. Steven is joined by family friend Ollie for the event. 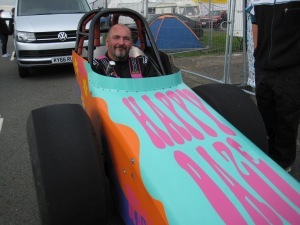 Wild Bunch racer Alan Lloyd in Gonzo the Great has run his first seven in the car. He said 'Before this event the car's PB was 8.23. I had put a new nitrous setup on for Dragstalgia but after 60ft it shut down which was due to a problem with the mechanical relays. I replaced them with solid state ones and it improved immediately'. The nitrous setup which is a 300hp kit is being run with 200hp jets and a controller limits the additional power to 120hp. 'Although the car has run hundreds of times on the ashphalt tracks to 8.3s, I still have to tune the car for it to run straight and get down the track on each pass; the four link settings and tyre pressures have always worked for us'. Tri Chevy shootout racer Jim Seward has this handsome blown '55 Bel Air in the entry of 17 cars who are racing for a trophy and points, former Fuel Altered racer Jim being fourth coming into this event. In round one he ran a 10.12/133 to defeat red-lighting no.1 qualifier Andy Bond. 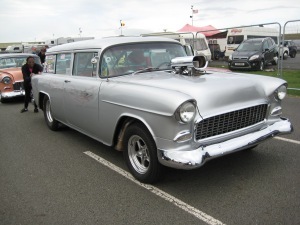 Tri Chevy shootout racer Steven Murphy went to the semi finals of the car eliminator where he lost to Graham Smith. Steven qualified fifth with a 11.44/119. Tri Chevy shootout racer Graham Smith, who is in his first full season of Topspeed Automotive Street Eliminator, has run a PB speed here of 148mph after changing tyres at the Euro Finals. He said 'I used to run Mickey Thompsons but changed to Hoosiers at the last event. We had to change the four link and alter the tyre pressures, a process of trial and error, but it's an education. 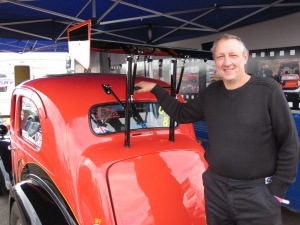 Snow White is 25 years old as a race car and I started the Tri Chevy Shootout at SCR with encouragement from Ken Brookes. The trophy for the championship is named the Roger Butterworth trophy in memory of Roger who used to run Snow White'. Graham's business is Serck Motorsports which custom builds radiators for racing cars and supplies nitrous and fuel injection components. 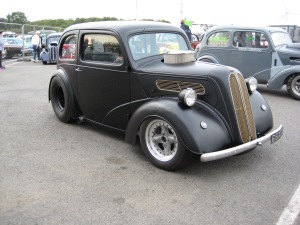 Customers include fellow Street Eliminator racer Joe Stevens who tested to 8.2s passes yesterday. 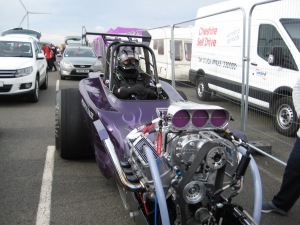 Supercharged Outlaw racer Paul Dale has been running well, just a couple of tenths off his PB of 8.9. The team said 'Our best runs have been 9.18 and 9.28 at 145mph, which have been mainly trouble free, we just had an exhaust gasket go on one side and a stuck carburettor float, it was all fixed in an hour and a half'. Supercharged Outlaws racer Andy 'Fadster' Hadfield suffered engine damage yesterday which has meant his HRDs finishing early. He said 'I'm due to race at Drachten for the first time this coming weekend, so we will have to strip the engine down tonight and order the parts on Monday and then rebuild as soon as I have all the parts. It's been an interesting year running at Clastres and the Isle of Man as well'. Andy's best run was a 8.01/172. 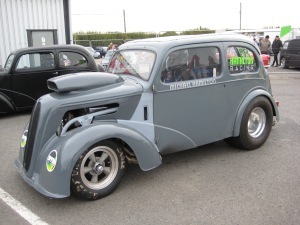 Outlaw Anglia racer Adrian Whitcombe is at his first racing event with his 514cu in Ford engined and TH400 transmission car which is new. He said 'It was scary doing my first run but I was pleased with a 11.349/124.54'. 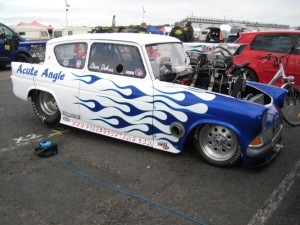 Outlaw Anglia racer Rob Turrington has owned his car for 29 years and ran it only once before at the 2014 Hot Rod Drags. He said 'A friend helped construct the roll cage but I did all the rest of the work myself. The chassis is the orignal boxed frame. 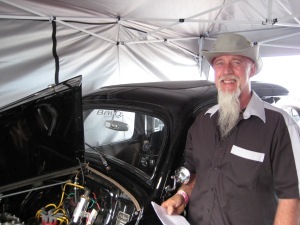 The engine is a 350cu in Chevy with an Edelbrock RPM Package which consists of matching heads, carburettor, cam and roller rockers. The bottom end is standard and the trans a TH400 by Paul Evans'. Rob ran a best of 11.12/119 and has run a total of six PBs this weekend, with help from a nitrous kit which took two seconds off his times. Outlaw Anglia racer Scott Crookston is heading towards runner up in the Championship, with Jedd Guy unable to run his car this weekend (instead he is crewing for Scott). Scott said 'The track was loose early this morning but great yesterday and I went 7.85 with a 200hp shot of nitrous. I hope to be able to run at the National Finals and am also entered for the Flame & Thunder, which will make it eleven meetings for us this year. Outlaw Anglia racer Colin Millar is back to back champion and his performance is impressive, having raised the bar in the class. He said 'This year the championship has been easier and here Paul Hensher has been our main competition although he has had oil pressure problems this morning'. Following a couple of naturally aspirated 7.8s, Colin flipped the 200hp nitrous switch and the times went down to 7.3s. 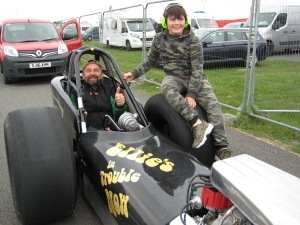 He remarked 'I could put 700hp of nitrous in the engine but no-one is really pushing me. I would love to run a six though!' Colin's highlights of the year are the new SPR track, and the welcome the OA racers received at Clastres. 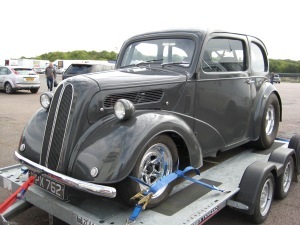 Outlaw Anglia racer Ronnie Mercer suffered a broken propshaft on the launch. He said 'It broke just after I released the transbrake button, there was a big bang and I stopped. 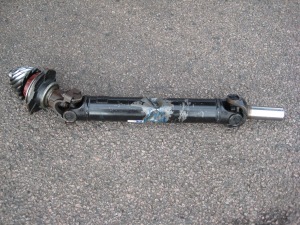 The propshaft loop prevented further damage, it's a big one. 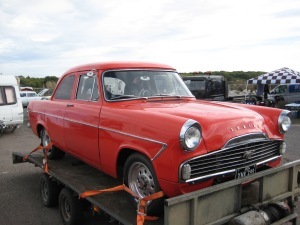 It broke the rear end casing and centre gears but the gearbox looks ok, so the repairs should be straightforward'. For eliminations, Col Law offered Ronnie use of his car, and after renaming and putting on Ronnie's race number, he qualified it and beat Rob Stone with a 10.6 in round one. 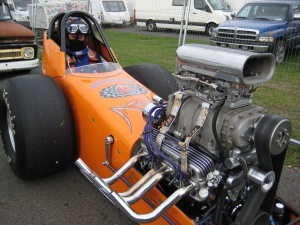 Outlaw Anglia Racer Barry Woodford had the startline crews attention yesterday when the carburettor caught on fire. He said 'The engine kept misfiring and it turned out there was a ripped gasket in the secondary valve. I ran a 105s this morning which is where we would have been had we not had the carb problem over the last two meetings'. 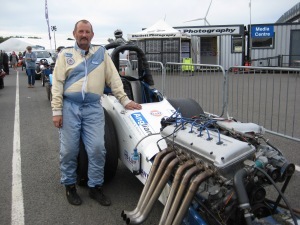 Wld Bunch racer Alan Loten in the Jag-engined Paranoia suffered engine damage from a nitrous issue. He said 'I did one run without nitrous which was fine then used nitrous but at three quarters of the way down it lost power and I discovered two plugs had melted and one piston had severe lack of compression. Fortunately I ordered some spare pistons when I had them made in the US and will rebuild the engine. But I need to see how the nitrous is causing detonation. The run was on for a 9.1 which is up with my PB of 9.12, but in the end it tailed off to a 9.5'. The car's all time best with previous co-owner Brian Thomas was 8.77/156 with nitrous, and Brian was here yesterday to spend time with his old team-mate and car. 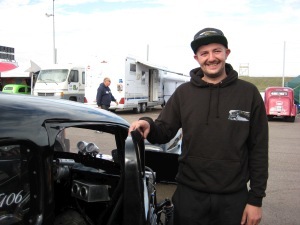 Wild Bunch racer Lee Hartnell has run four events this year, two at SPR and two at Dakota Raceway. He said 'We have a new engine and heads and the crank has been reground and we have o-rings on the block and copper gaskets which look to have solved the gasket-burning problems. 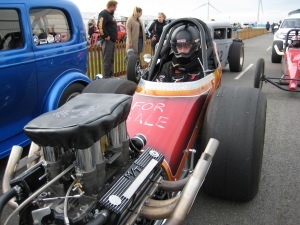 My best before the blow up a couple of years ago was 10.8 and here I ran a 10.9 on a second gear launch'. Lee had quite a scary moment yesterday when the car got seriously out of shape (see our gallery) but his driving skills prevented a loss of control. Thanks to Nick Pettitt for bringing to our attention that Ian Demaine and his Mustang-powered Zodiac which raced at Santa Pod in 1967 are back here again after 51 years. 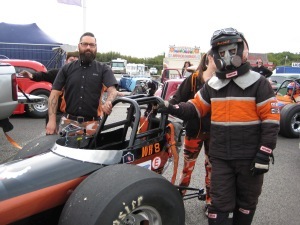 Outlaw Anglia racer Simon Barlow was delighted to run his first sevens in the Orange Pop Racing Fordson. He said 'The engine was turned down, the timing was soft and it was the same setup that we ran at Redline Rumble. It felt great, arrow straight. There need to be some chassis mods as it is twisting on the launch and Jon Webster will be working on it. We couldn't make eliminations as the mag had moved despite having three clamps and the engine wouldn't fire, but will run later'.